Home » Regattas » Team Furio Wins Italian Nationals Again! 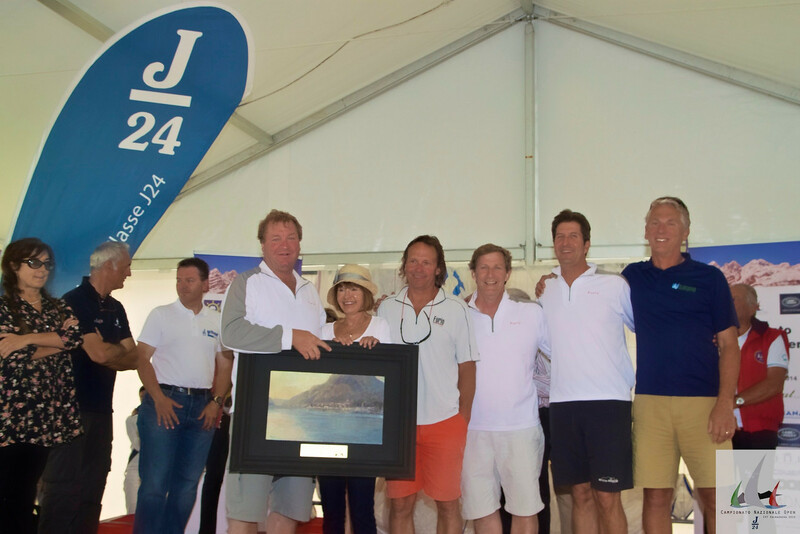 Posted by j24fleet on Jul 31, 2014 in Regattas | Comments Off on Team Furio Wins Italian Nationals Again! 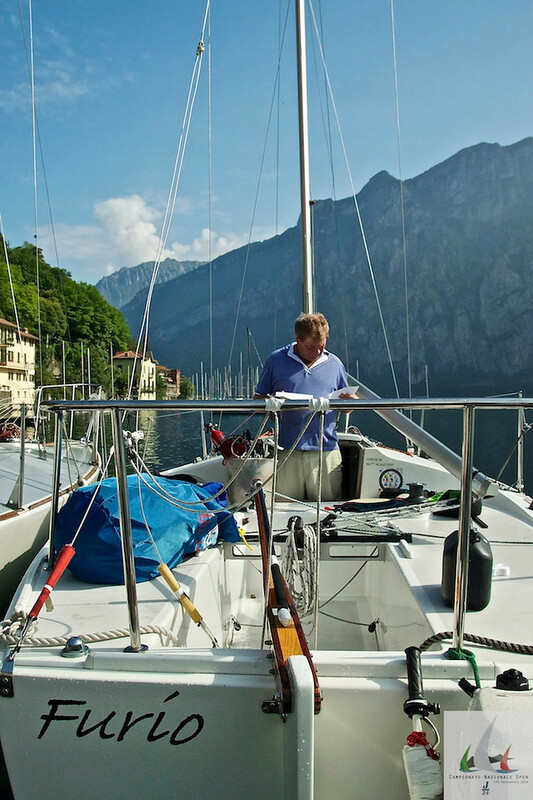 Arriving on the shores of Lake Como for the first time, Team Tundra (aka “Furio”) quickly affirmed our own expectations…this was going to be challenging mountain lake sailing venue. 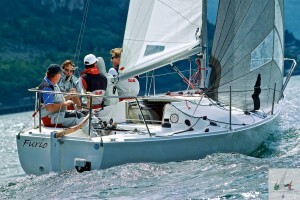 The kind of sailing that the many years of experience on our very own Lake Washington might serve us well. Mountains rising up out of the water, lining nearly the full length of the Lake, with waters deep and narrow. It was certain to be a shifty and puffy event, but was it to be a one-sided race course, or was it a venue where anything goes? The first races would tell. 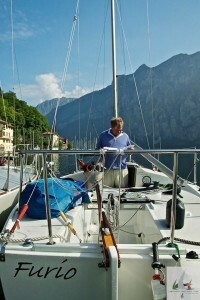 The Furio team, steeped in many years of Italian racing adventures, has had a consistent core of three; owners Keith Whittemore and KK Kast, and long time friend and sailing companion Kevin Downey. These three are the quintessential American ambassadors in European sailing circles, with special recognition and affection in the Italian arena where they have competed in some ten straight Italian Nationals, two European Championships, and a Worlds. Keith is the helmsman, Kevin trimmer, KK middle/mast, and this year’s supporting cast of bowman Mark Rodgers and tactician Brian Thomas rounded out the team hoping to defend Furio’s Italian Championship result last year in Anzio. That victory, sailed in the Med in big seas and big winds was a distant memory as the team faced the light air and flat waters of this mountain retreat. Racing in Italy is an interesting experience, and one the Furio team would wholeheartedly recommend to all of our friends and competitors here in Seattle and the US. The Italian culture, the people, the food, the countryside, the customs and the coffee all add up to one amazing adventure every time we go. So much to see, explore and enjoy and yet perhaps the most exciting experience in all of Italy as a visiting sailor, is the starting line, inside the one minute mark! In the years of Italian sailing experience, the Furio team has learned a few lessons to help us navigate thru this minute in time. Alas, in spite of many hours in the classroom, new lessons are taught by the crafty Italian sailors, and it feels like the learning curve remains steep! The racing schedule called for ten races over four days. Nothing too unusual. Until one read the fine print about the start time for the first race each day….0800hrs! We presumed this was a typo, and anticipated racing would start at the typically leisurely time of 1100. As it turns out, Lake Como has two winds, one from the North in the morning hours, and one from the South in the afternoon. It was not a typo, and yes, Furio left the dock each morning at 0700 after a quick Italian breakfast and the always present cappuccino. Typically finishing two races on the morning breeze, and one or two on the afternoon breeze after a 2-3 hour respite ashore in between. Quite civilized really, except for that 0600 alarm and the requisite early bedtime. The racing was as always in Italy, furious around the start line. It seems the starting rules may not be fully in play at the starts as seemingly all the boats expect to be on or above the line, at the start. The concept of a 2nd row start is as foreign a notion as some of the rules about barging or failing to avoid collisions, or leeward boats having right of way. When the gun goes off, the goal is to not be entangled with any other boats luffing head to wind, and after that, simply to be heading upwind, with clear air. In those crucial early races, where the goal is to not be out of contention after the first day (no letters!) Team Furio kept her nose clean. Keith did a great job getting off the line and we managed to avoid any deadly tactical mistakes and as always Keith and Kevin had the boat moving fast through the water up and down the course. With some 35 boats on the line, including several top German teams and many good local sailors along with a number of top Italians from around the country, we were pleased to finish day one on top. The morning northerly was a wonderful sailing breeze. Relatively steady, and in the 8-13kn range. It generally paid to work the right hand shore, but not always. And if you went too far right, you could easily go from penthouse to outhouse in minutes. The afternoon southerly was a tricky wind often with holes, and commonly favoring the beach on the right hand side. At times the scene was reminiscent of tacking up the city front in SanFran, with multiple tacks, crossings, ducks, daring the depth on the beach and always facing the decision of when to break from the shore out to the mark. Similar, but in just 5-7knots, no current and flat water, different. Three days later, with the full ten race series complete, Team Furio had defended its title as Italian National Championship victors, and this time, without sailing the final race. The prize giving was especially touching as the applause, and heartfelt congratulations from our Italian friends was very moving. It’s clear they really do appreciate Keith, KK and Team Furio making the effort to come again and again to their Championship. It felt good to be there again, and it’s a near certainty the Team will return again next year to the site of the 2006 Championship at Porto Ercole. Who else from Seattle will be there? ?